Demand for environmentally friendly vehicles progressively increasing. The indication is also captured well by Yamaha Motor Corporation by launching Vino run an electric engine. Reported Responsjp, Thursday (07/30/2015), this retro-styled scooter powered electric motor DC. Lithium-ion battery with a power of 50 V is prepared for electrical energy storage scooter in Indonesia is marketed as Mio Fino. On paper, the battery on the scooter called E-Vino is able to be used for distances up to 29 kilometers in full. Additionally, the battery also easy removable for recharging. If the power runs out, the battery can be charged at home plugs with mains voltage of 100 V. The battery charging to full state took over three hours. 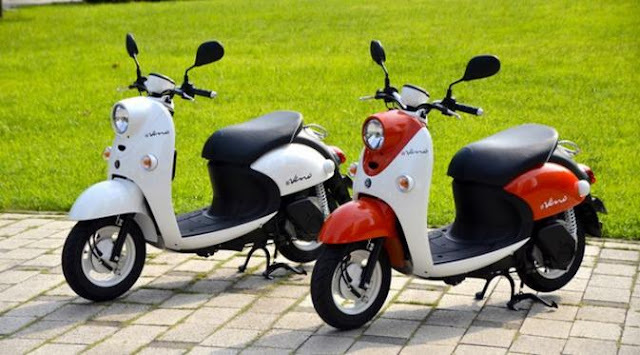 Different from electric bicycles are widely available on the market, the scooter is equipped with features to choose the output power generated. There are three modes available, namely standard, power, and boost. Last mode can be used when the scooter across the ramp or hilly areas. Not escape, the trunk with a volume of 10 liters has also been prepared to accommodate the luggage brought rider. The position of the trunk is located behind the seat and blend with the battery holder. Yamaha began marketing E-Vino on 29 September. This scooter itself will be manufactured by Yamaha Motor Taiwan. This scooter is sold in Japan at a price of 236 520 yen or approximately USD 25.6 million. Yamaha gives a discount of 20 thousand yenor Rp 2.17 million during the promotion period.